By CHARLES J. ADAMS JR. The perks or “perquisites” of good old Carsonia Park were many, not the least of which for me is 60 years of a long and happy marriage. If it were not for the venerable amusement park, there’d be no Charlie Adams III, or for that matter, no Emily or Kevin Adams. The “Summer of ‘42” I became a thoroughgoing dyed-in-the-wool Carsonian. 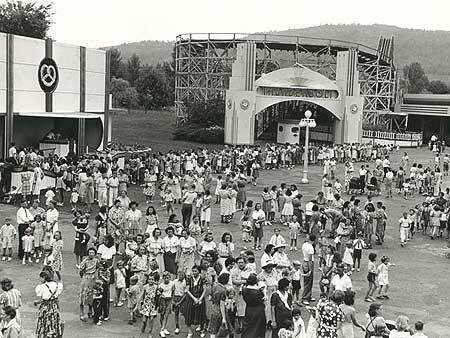 Sixty-one years ago, I made one of my frequent visits to the fun park. My friend Billy and I were watching the free hillbilly show, when directly in front of us was this great looking blonde on her “tippy-toes,” doing her best to see the band on stage. “Hey, Blondie, can I lift you up?” I asked. As you might suspect, she ignored my come-on. …so much for that move. Sometime later as we strolled the midway, Billy spotted his grandparents resting in front of the “Old Reading (Bavarian) Beer Garden. He joined the old folks on the bench. It held three: no room for me. About six feet away sat “Blondie,” her older sister and young cousin. CARSONIA PARK… Oh, all the marvelous and sentimental memories. I must have been about twelve years old when I first experienced the joy and pleasure of the fun park. 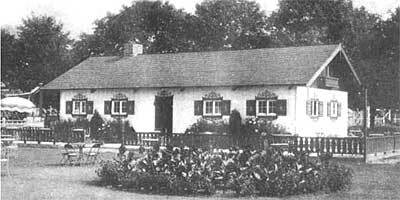 Back in the mid ‘30s we lived in East Reading, about 4 miles from Carsonia. On half-price days Mom and Pop and the brood (5 kids) walked the whole way. Who could afford the seven trolley fares? Pop only made about 18 bucks a week back in those Depression years, so only a few pennies were given to “have fun.” On half-price day, we did get to go on more rides, and eat more hot dogs. The park’s exciting and stirring sounds were a big part of our over-all enjoyment. Barrel Organ music emanated from the Carousel “Merry-go-round.” The midway attractions, even without the nickels and dimes, were in themselves worth the visit. Just watching the riders on the miniature roller coaster (“Whiz-Bang”) or the bumper cars (“Dodge’em,”) was great fun. Now and then we could afford to ride in one of those little round cars with the big rubber bumpers, and do our darnedest to dodge the older drivers determined to crash into us. Sometimes we had the satisfaction of giving back what they gave– SLAM, BANG! When we had a few nickels to spare, we would take a fearsome ride on the swinging Airplane (Circle Swing), or risk the breakneck speed of the Miniature Speedway in one of its battery-operated racecars. The really big adventure was the great appeal of the Thunderbolt roller coaster, earlier known as the Jack Rabbit. It was scary to this 12-year-old. How I remember the clickity-clack and clang of the cars as they creeped and crawled to the top…hesitated…and hurtled down with great force, snaking around the many curves, all to the shrieking delight of the riders. As we grew older, we managed to enjoy the 10 cent motorboat rides on the artificial Crystal Lake, and a dunk in the swimming pool close by. In our teens we got to see many famous big bands of the day in the opulent Crystal Ballroom. O.K., that was back in the ‘30s. Here we move up to 1942. I was an 18-year-old city kid with an indefinite future, and not a nickel in my pocket. But I was back at my favorite haunt: Carsonia Park. “Blondie” wrote me that she, her sister and cousin would be there on Sunday. …and I’m broke! I’d lost my last 50 cents in a penny-ante poker game at the local playground. To make this long story short, I went to meet her anyway. I felt like a gigolo. Blondie paid the 10 cents for our ride in the Old Mill. It was a ride in the dark in a gondola car, through a moving channel of water, passing all sorts of scary scenes: ghosts, skeletons, and monsters. It ended with the boat being lifted up an incline, then dropped, splashing down into a big pool of water below. Did we smooch in the dark? Just a little kiss. My first? Well, maybe my second. Her first? I never asked to this day. Certainly our first. For the next year, this city kid made dozens of bus or hitchhiking trips to Hamburg, Pennsylvania. Blondie and I were engaged on my 19th birthday in April 1943. We were wed that July while I was on Navy boot-camp leave during World War Two. You remember WW II ? —it was in all the papers at the time. The war is over; I survived three invasions. Our only son was conceived two years later. What you have just read was the perks of Carsonia. They say, “You can’t go home again.” We can. The “Old Reading Beer Garden” building is still there. It’s been a restaurant these many years. Our “meeting bench” is gone. The memories live on. Where have the years gone? Down the midway of life? Thank you, Carsonia Park! Charles J. Adams, Jr. is a retired Berks County dry cleaner and a veteran of World War II. He is a published cartoonist and writer of weekly columns for six Pennsylvania newspapers. His cartoon books, “Berks Banality,” are available at the Historical Society’s gift shop. Charles and Mabel (Williamson) Adams celebrated 60 sixty years marriage this year. They are the parents of Charles J. Adams, III, well-known writer, broadcaster and Historical Society Trustee. 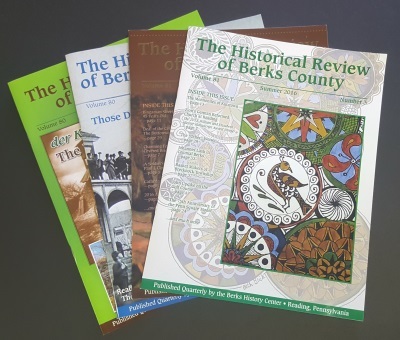 This article originally appeared in the Winter 2003 -2004 issue of The Historical Review of Berks County.